The Capybara is the world’s largest rodent. Adults reach a length of 130cm and weigh around 50kg. They are excellent swimmers and have several adaptations for their semi-aquatic lifestyle, including a large amount of fatty tissue and partially webbed feet. The Capybara is a herbivore, most commonly feeding on grass, but their diet may also include aquatic vegetation, such as water hyacinths, as well as other plants and sometimes fruit. They generally feed in mornings and evenings. Capybaras usually swim with their eyes, nostrils and ears protruding out of the water, often entering water to cool down when temperatures are at their highest. They can dive underwater and stay submerged for up to five minutes, and often hide and escape from predators in this way. Capybaras commonly form groups of up to 20 individuals although during the dry season as many as 50 or 100 individuals may live together. They communicate using a range of sounds, including growls, whinnies and alarm barks. Males have a highly developed scent gland on top of the snout, known as a morillo. This prominent, dark, raised area secretes a copious white, sticky fluid, thought to be involved in signalling dominance status. 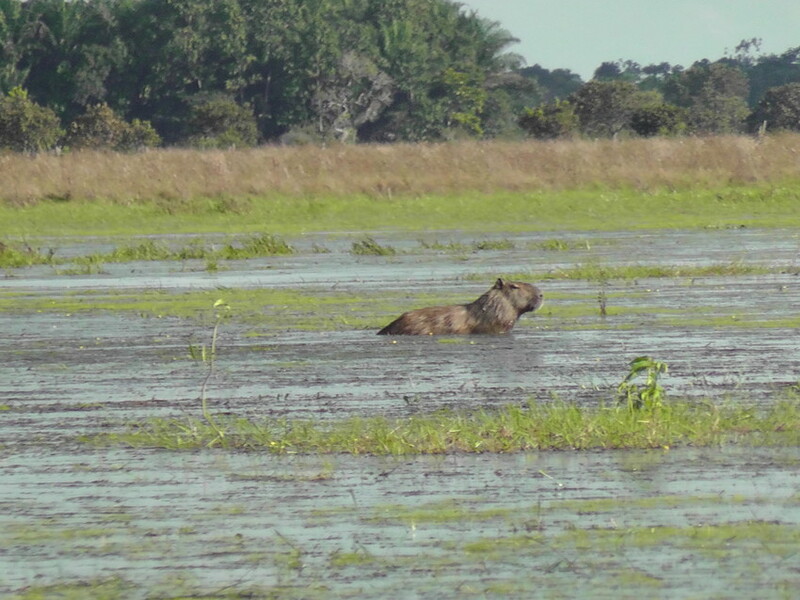 Capybaras mate in the water. After a gestation period of 130-150 days, females give birth to litters of up to eight pups (four is the usual number). Offspring are highly developed at birth, and are able to follow the female and feed on grass within the first few weeks of life. All young within the group tend to stay together and are cared for communally. Youngsters may suckle from any nursing female until weaned at about 16 weeks. Capybaras may live for up to 10 years in the wild. Capybara live across Central and South America in a variety of lowland habitats close to water, including marshes, estuaries, and along rivers and streams. Populations in the rainforest are small and narrowly restricted to open watersides. Although populations are stable across much of their range, Capybaras are threatened by hunting for meat, for their leather, which is valued across South America, and for grease from their fatty tissue, which is used in pharmaceuticals. 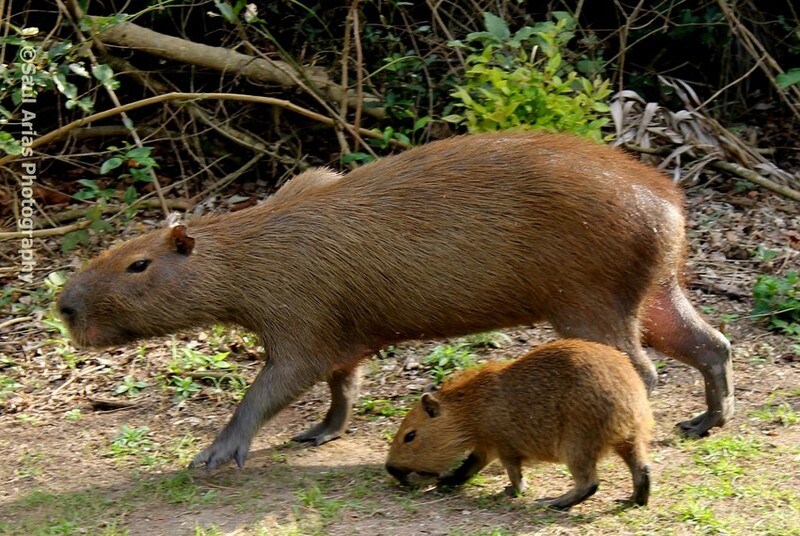 In Peru and Bolivia some Capybaras are hunted for use as bait.